LeBron James and the Cleveland Cavaliers are the first team to be featured on NBA Real Training Camp Facebook simulcast produced by NBA Digital. This first-ever live sports program streamed on the number one social media platform marks a milestone for the NBA as they continue to be on the forefront of digital content consumption and distribution across top social hubs. 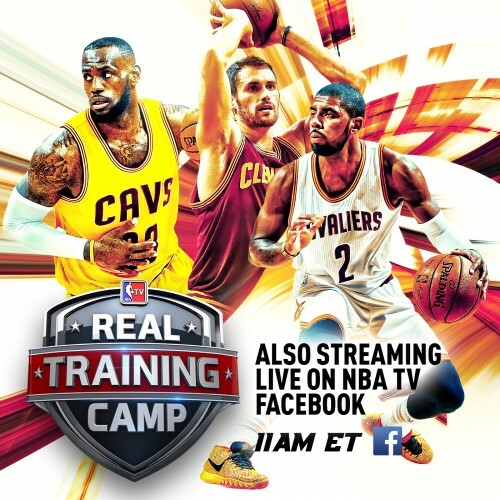 The Real Training Camp live, first-ever real-time video feed will be simulcast over the NBATV Facebook page, NBA TV and NBA.com. Turner Sports and the NBA PR departments shared this sports technology driven information with the Sports Techie community blog and I hope you all enjoy this cutting-edge opportunity to view and interact with free professional basketball content on Thursday, Oct. 1, at 11 a.m. EST. Will the next generation of Millennial viewers tune in? 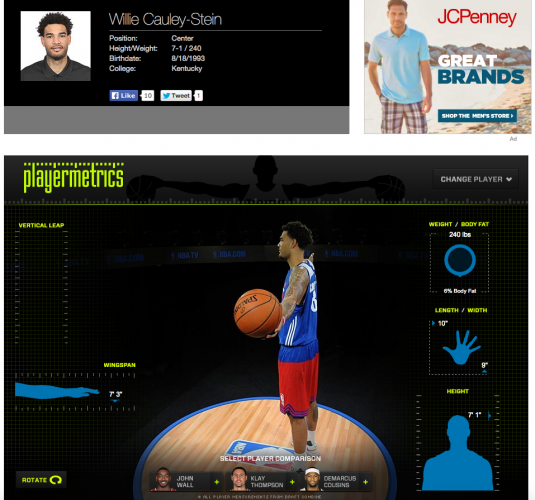 The NBA Facebook fan page has 27,361,013 International hoops fans that like it. This makes the NBA’s Facebook fan following larger than the populous of Texas which according to U.S. census data has 26,956,958 citizens making it the second most populated state behind California. So it certainly makes good business sense to enhance the NBA fan experience and attract Millennials on Facebook by activating their global fans with an exclusive special edition of the Real Training Camp show allowing rabid, casual and new fans intimate access to the world’s best player and the defending Eastern Conference Champions team practice along with insightful interviews with players, coaches and front office personnel. “We have a long history with Facebook and are excited to team up with them for another first of its kind initiative, as we bring the excitement of Real Training Camp with Head Coach David Blatt, LeBron James and the Cleveland Cavaliers to an even broader audience,” said Albert “Scooter” Vertino, general manager of NBA Digital and SVP of programming, Turner Sports. Veteran host Vince Cellini will head the innovative program from Cleveland together with NBA TV analyst and former Cavaliers and Atlanta Hawks head coach, Mike “The Czar” Fratello. NBA Digital is jointly-managed by the NBA and Turner Sports here in Atlanta. They are pioneering the sports tech industry by streaming the Real Training Camp Series featuring the Cavs, along with the Memphis Grizzlies, Milwaukee Bucks and Minnesota Timberwolves beginning today, Tuesday, Sept. 29. In addition to Thursday’s special edition of the show, NBA TV’s weeklong NBA Real Training Camp series delivers the Minnesota Timberwolves and 2014-15 Kia NBA Rookie of the Year Andrew Wiggins (Tuesday, Sept. 29), Milwaukee Bucks and head coach Jason Kidd (Wednesday, Sept. 30) and Memphis Grizzlies and Marc Gasol (Friday, Oct. 2), with all episodes streamed live on NBA.com. “Our goal is always to provide the most compelling content for our fans any way they choose to consume it and this initiative will expand the visibility of this quality daytime programming,” added Vertino. Sports Techie, when you want to make a splash on Facebook to new, established and fringe fans, it is wise of the NBA to feature the Cavs and superstars LeBron, Kevin Love and Atlanta high school legend Kyrie Irving on Real Training Camp because they are cross-generational and extra hungry to get back to the NBA Finals in 2016. The title was won last season by the Golden State Warriors and MVP Stephen Curry during the 2014/2015 season over the injury riddled Cavs. The millennial generation ranges from 13 to 18, to either 32 or 35 year-olds, while Generation Z is said to be 1 to 13 year-old kids making them both tough demographic groups to crack in that they mostly live with their digital devices in hand morning, noon and night yet are not into traditional media sources and established brands like Generation X and older adults are. Capturing both these groups attention is the billion dollar question as experts say Millennial’s have the most amount of disposable income yet are not very loyal to existing brands instead preferring to engage with one another across less popular technologies. A good example is their use of Snapchat, an application many older adults do not use yet with a valuation in the billions. The problem is many Millennial are not on Facebook or have stopped using it for a variety of reasons. Perhaps it’s because their parents are on it, it could be they like Instagram and other social hubs like Periscope more to follow sport, or maybe the mindshare pressure of staying engaged where their peers are keeps them too busy to establish or continue using a Facebook user name. The NBA has perhaps a billion fans across America and around the world when you include China’s 1,367,485,388 citizens. To one degree or another, they all love to follow their favorite teams and All-Star, rookie and local players daily over the preseason, regular season 82 game schedule, and during the postseason playoffs and NBA Championships using smartphones, tablets and computers, as well as smart TVs and OTT boxes. My educated guess is the NBATV’s 5,856,955 fans at the very least will enjoy the Real Training Camp endeavor and the show will be a hit on Facebook since it costs nothing to stream for fans. Will Real Training Camp hook the younger generations? That is why you feature certain Hall of Fame member LeBron and the mighty Cavs because if that won’t do it, what will.